Today everything was different! Although the two events yesterday were large, they felt intimate compared to today's event in Qwest Field stadium. For those of you who don't live in Seattle, Qwest Field is the home of the Seahawks, the Seattle football team (as well as other events). Being that I don't follow football, I have never attended a game at Qwest field. Thus, I was in awe of the size of Qwest field. I arrived much too early but I had hoped to attend an event in an auditorium right off Qwest field but they hadn't done a very good job organizationally explaining that the press would have to choose one or the other event. So, a bunch of us ended up milling about Qwest field for a few hours. One of the enjoyable activities I experienced was walking back and forth across the field itself. As I said, the stadium is enormous and to walk across that grass at the base of it was nothing less than awesome. I don't think I have ever stood in the middle of a stadium field! To extend my time on the field, I just took photos now and then: the stage where the Dalai Lama and the Washington State Governor would be standing, the Seattle skyline behind the stadium, the bleachers, basically whatever looked like it could be photographed. There is much to write about this event but I am simply and utterly exhausted. In the meantime, if you want to see what I have been seeing, just go to: www.seedsofcompassion.net/webcast/index.html - you can see all three events which I attended as well as the evening event last night with David Matthews! Why Should I Speak It If You Don't? 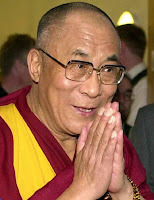 The Dalai Lama is Coming to Town!